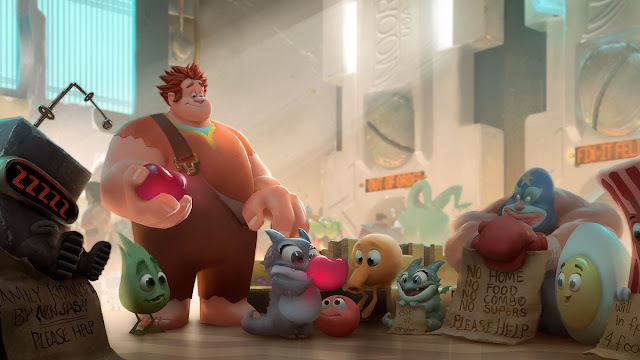 Walt Disney Animation's video game themed comedy Wreck-It Ralph is a mostly charming exploration of pop culture and adventure. The Disney animated feature is a mishmash of different elements encompassing gaming, 3D animation, and children's entertainment. Heavily influenced by the first wave of films from its sister studio Pixar (think Toy Story), it balances cultural references with themes of friendship and identity. Ralph (voiced by John C. Reilly) is the baddie in a Donkey Kong like game who grows dissatisfied with his life after living inside an arcade game for thirty years. He's upset with his role and longs to be the hero. The film sets up its environment wonderfully, establishing how game characters live, setting up a train station portal between games. It introduces things through a support group full of real video game villains lamenting their jobs. The conversation between famous game characters is entertaining and clever. Soon, Ralph leaves his game to find redemption in futuristic war game before transitioning to the film's main setting, "Sugar Rush", a video game mash up of Candyland and Mario Kart. From there, everything becomes fairly conventional with an adventure full of the usual character development and buddy style comedy. The film abandons its own momentum and sense of wonder, built so gleefully, and enjoyably constructed in the first act. Once Ralph arrives in Sugar Rush and meets his little girl race car driving sidekick Vanellope (Sarah Silverman), the overall arc slows down. I wanted more from the setting in an arcade where video games come to life after dark. One thing Wreck-It Ralph has in spades is heart and a healthy amount of Disney magic. The characters, voice acting, and general adventure is amusing and entertaining. It's just disappointing after the promise of the first thirty minutes, building a strong animated momentum that goes flat. Wreck-It Ralph is an admirable animated adventure but falls short of being extra special.